It is rare to visit a museum and purchase art that is not from the gift shop. The historic art and local artifacts hang on the walls, allowing you to observe, but not touch. 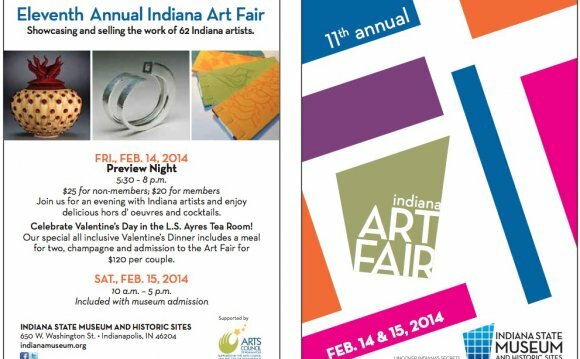 But from 10 am to 5 pm on Saturday, February 13, the Indiana State Museum will become a shoppers delight as guests have a chance to browse and buy from over 60 Indiana artists at the 13th Annual Indiana Art Fair. Are you thinking ahead to spring cleaning and want to spruce up your home decor? Or maybe you want to find that perfect piece that represents your love of Indiana? Guests will find a mix of contemporary and traditional art, wearables, photography, woodworking, ceramics, textiles and more, all crafted by hand from Indiana’s artists representing 28 counties. A full list can be found here. Unlike Indy’s summer art fairs, those attending the 13th Annual Indiana Art Fair have the option to park in the Indiana State Museum garage and enjoy shopping in a warm environment with no worries of weather or crowded spaces. If you have not shopped until you dropped, the museum’s exhibits, such as the natural and cultural history core galleries, will be open and available for you to enjoy. In addition, the Retro Arcade, which has been extended until May 1, will be open for you to explore your favorite after-school arcade games. Admission to the 13th Annual Indiana Art Fair is free for museum members and included for museum admission for non-members. Make it a date night and attend the preview event, “Galentine’s Art Night, ” on Friday, February 12 from 6 pm to 9 pm where ticket holders will enjoy hor d’oeurvres and cocktails while you shop the art before the masses on Saturday. Try your hand at painting your own masterpiece with pre-registration at the door as spots will be limited. Tickets are $35 for members and $45 for non-members. Your Friday night ticket also includes admission to Saturday’s event. For more information, visit here.